When the intent to address the history of the WWII U.S. airborne forces was first contemplated, the reaction was What can one do that hasn t already been done? Upon hearing of the project, historians, advanced researchers, collectors, and fans of the airborne stepped forward asking, What can I do to help? What was initially intended to be a single volume has turned into a formidable series on the subject. This first volume deals in great detail with the Early Years, Airborne Training, Parachute Qualification Wings and Trimmings, Evolution of Military Parachutes, Jump Helmets, and Paramarines in 528 pages, 1660 photos (most in full color), large format deluxe binding, with the first 500 copies signed and serial numbered - at a bargain price of $94.95 plus postage. 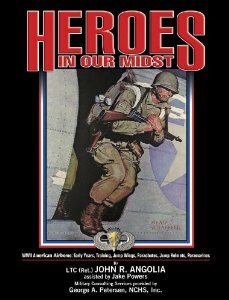 Future volumes, each over 500 pages, will cover Troop Carriers, Glider Troops, Pathfinders, Service and Jump Uniforms, Divisional/ Unit patches, Distinctive Insignia, Special Insignia, Equipment, Weapons, Tactical Operations, Unit Colors (Flags and Guidons), and Paper-Related Collectibles.